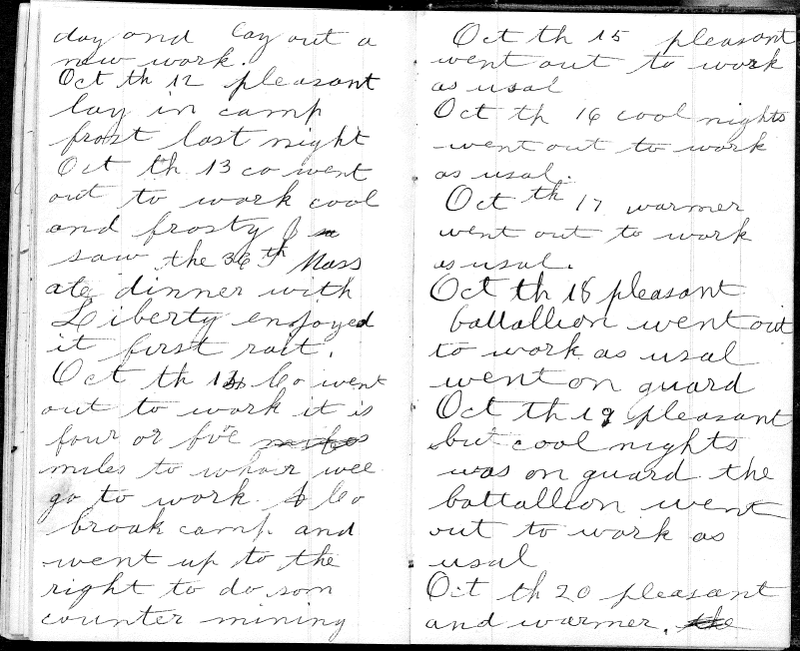 Editor’s Note: Isaac Foskett of the United States Engineer Battalion kept a diary during the Siege of Petersburg. 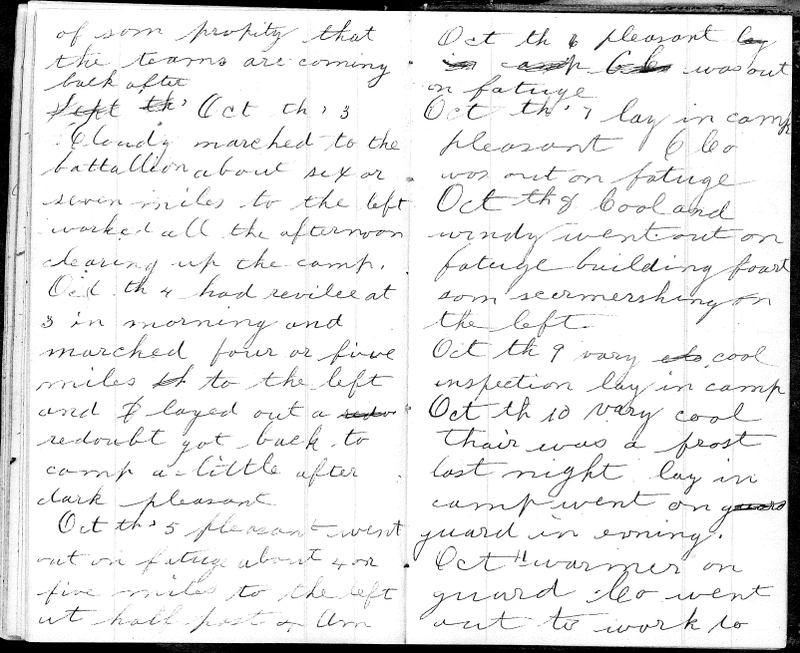 His brother’s direct descendant John Foskett was kind enough to provide images of the diary for transcription, and Dan O’Connell transcribed the diary for publication at The Siege of Petersburg Online. The transcriptions and images seen here are copyrighted by Dan O’Connell and John Foskett, respectively, and may not be reproduced without their express written consent. All rights reserved. Oct the 1: Rained all day. 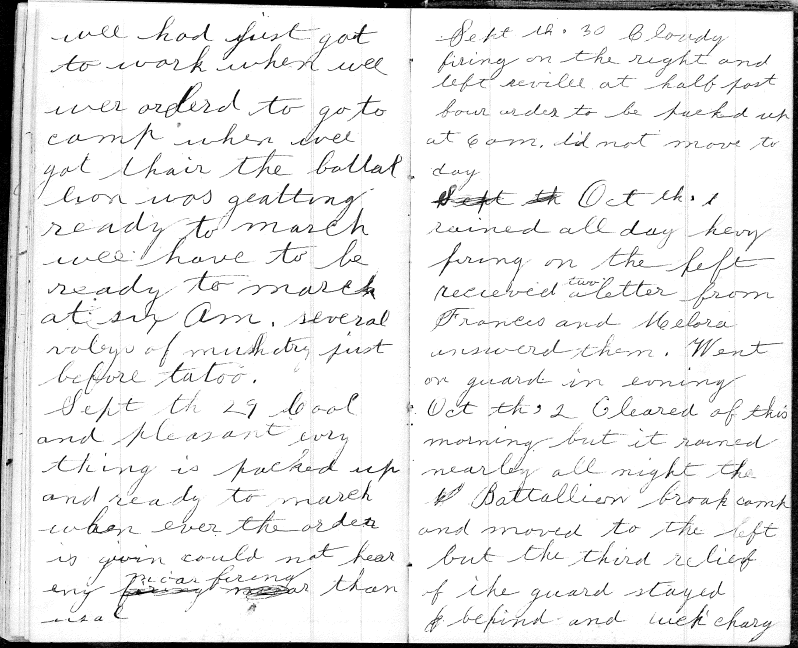 Heavy firing on the left received two letters from Frances and Melora. Answered them. Went on guard in the evening. Oct the 2: Cleared off this morning bit it rained nearly all night. The battalion broke camp and moved to the left but the third relief of the guard stayed behind and took charge of some property that the teams are coming back after. Oct the 3: Cloudy. Marched to the battalion about six or seven miles to the left. Worked all the afternoon clearing up the camp. 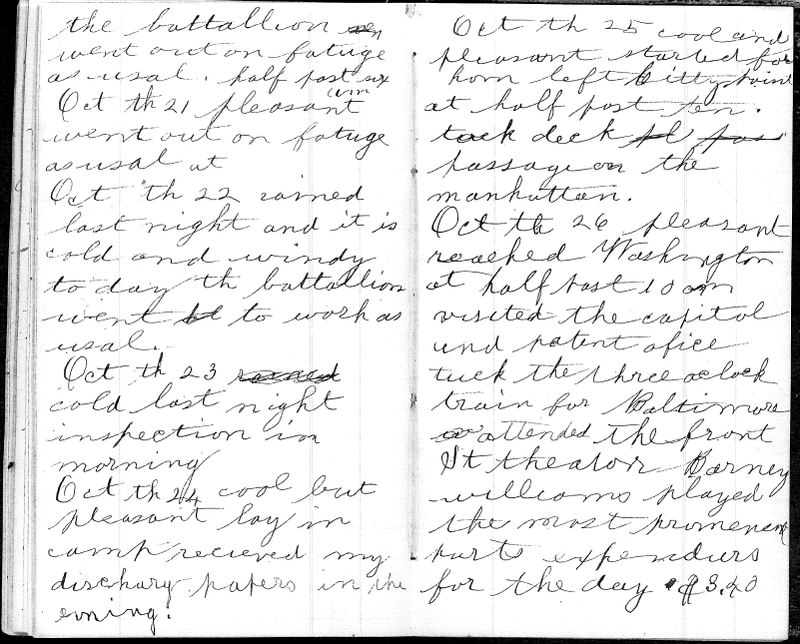 Oct the 4: Had revile at 3 in morning and marched four or five miles to the left and laid out a redoubt. Got back to camp a little after dark. Pleasant. Oct the 5: Pleasant. Went out on fatigue about 4 or 5 miles to the left at half past 4 a.m.
Oct the 6: Pleasant. Was out on fatigue. Oct the 7: Lay in camp. Pleasant. Co C was out on fatigue. Oct the 8: Cool and windy. Went out on fatigue building fort. Some skirmishing on the left. Oct 9: Very cool. Inspection. Lay in camp. Oct 10: Very cool. There was a frost last night. Lay in camp. Went on guard in evening. Oct 11: Warmer. On guard. Co. went out to work today and lay out a new work. Oct the 12: Pleasant. Lay in camp. Frost last night. Oct the 13: Co. went out to work. Cool and frosty. I saw the 36th Mass. Ate dinner with Liberty. Enjoyed it first rate. Oct 14: Co. went out to work. It is four or five miles to where we go to work. A Co. broke camp and went up to the right to do some counter-mining. Oct 15: Pleasant. Went out to work as usual. Oct 16: Cool nights. Went out to work as usual. Oct 17: Warmer. Went out to work as usual. Oct 18: Pleasant. Battalion went out to work as usual. Went on guard. Oct 19: Pleasant but cool nights. Was on guard. The battalion went out to work as usual. Oct 20: Pleasant and warmer. The battalion went out to fatigue as usual. Half past six a.m.
Oct 21: Pleasant. Went out to fatigue as usual. Oct 22: Rained last night and it is cold and windy today. The battalion went to work as usual. Oct 23: Cold last night. Inspection in the morning. Oct 24: Cool but pleasant. Lay in camp. Received my discharge papers in the evening. Oct 25: Cool and pleasant. Started for home. Left City Point at half past ten. Took deck passage on the Manhattan. Oct 26: Pleasant. Reached Washington at half past 10 a.m. Visited the Capitol and the patent office. Took the three o’clock train for Baltimore. Attended the Front Street Theater. Barney Williams played the most prominent parts. Expenditures for the day $3.40. Oct 27: Cloudy. Railroad fair from Baltimore to Philadelphia $2. 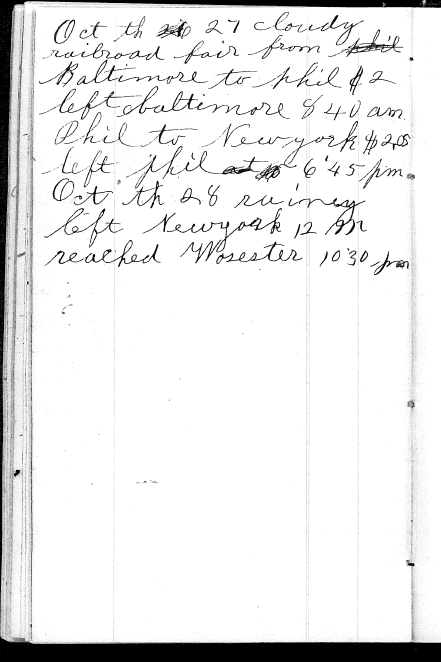 Left Baltimore 8:40 a.m.. Philadelphia to New York $2.05 left Philadelphia at 6.45 p.m.